﻿ Dar Taliwint Hotel Marrakech. JIMAT di Agoda.com! Ada soalan mengenai Dar Taliwint Hotel? Terletak di Medina, Dar Taliwint Hotel merupakan tempat menarik untuk memulakan pengalaman di Marrakech dan kawasan sekitarnya. Pusat bandar hanya 2. Km jauhnya dan boleh sampai ke lapangan terbang dalam tempoh 20 minit. Persekitaran yang terjaga dan kedudukan berhampiran dengan Istana Bahia, Dar Si Said, Maison Tiskiwin memberi hotel ini daya tarikan istimewa. Dar Taliwint Hotel juga menawarkan banyak kemudahan untuk memperkayakan penginapan anda di Marrakech. Untuk menamakan beberapa kemudahan di hotel ini, terdapat Wi-Fi percuma semua bilik, pengemasan harian, khidmat teksi, Wi-Fi di tempat awam, tempat letak kereta. Alami bilik dengan kemudahan berkualiti tinggi sepanjang anda menginap di sini. Sebahagian bilik menyediakan internet wayarles, internet wayarles (percuma), bilik larangan merokok, penyaman udara, pemanas untuk memudahkan tetamu berehat dan kembali bertenaga. Hotel ini menawarkan banyak peluang rekreasi yang unik seperti padang golf (dalam jarak 3 km) , rumah urut, bilik wap, bilik permainan. Apa juga tujuan lawatan, Dar Taliwint Hotel merupakan pilihan yang terbaik bagi penginapan anda di Marrakech. Fantastic, I would definetely recommend my friends. 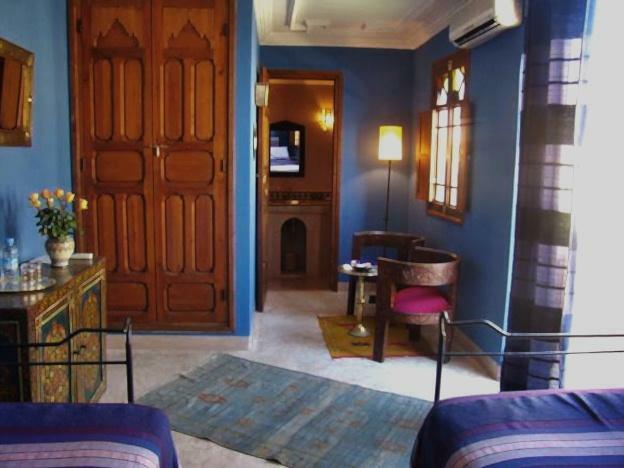 It was very central located three storey riad, cozy and warm feeling. Owner Dominique was extremely nice and patient with us, recommended a super super good restaurant for us, we had a wonderful Chinese New Year Eve feast. Rooms are spacious and nicely decorated, breakfast was delicious too. Highly recommend. We enjoyed it immensely. Dominque our host couldn't have been any nicer and informative. The Riad itself was very beautiful and comfortable. Located in a great part of the Medina, a five minute walk to everything but still quiet! Dar Taliwant holds a very special place in my heart – it’s a beautiful riad with big rooms in gorgeous Moroccan style; huge bathrooms and yummy breakfasts are just the start, there are excellent restaurants nearby and everyone at Dar Taliwant provided us with such amazing advice and hospitality. Nothing was a problem at Dar Taliwint. We couldn't have asked for more. Thank you for a wonderful experience, it’s not often you leave a hotel feeling like a friend. What an oasis in the middle of the desert! The owner was very hospitable, and the stay here really made my trip a great one. 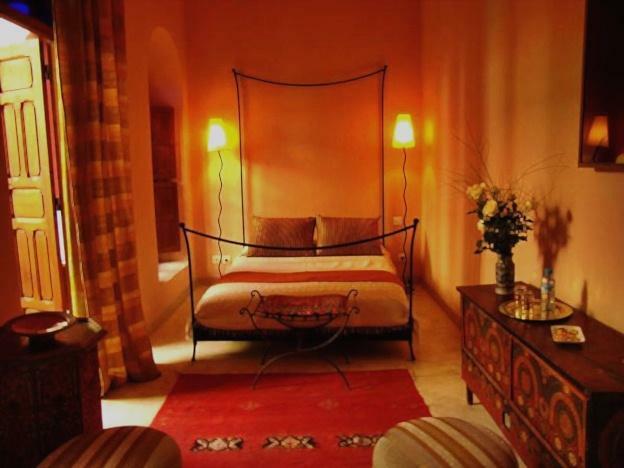 The room was beautiful and comfortable; I received assistance on where to eat well, and also on hiring a driver for a day in the Atlas mountains. lovely host, he made us feel really welcome right from the start. we had mint tea and moroccan sweets with him whilst we talked about marrakech and our stay at the riad. he was very helpful. the other staff were also lovely and willing to help if we needed anything. breakfast started at 8 and "until midnight" so whenever you wanted it. we got up between half nine and half eleven during our five days! the room we had was beautiful it was on the top floor and had an en-suite bathroom that was also amazing. wifi was available free of charge and there was also a bookshelf of books. brilliant location as it's close to the square that there's an easy route there but in a location that's away from the hustle and bustle. i don't think i can fault them for anything! my party consisted of my mom, sister, boyfriend, and myself. we stayed for 4 nights over the weekend of new years eve 2012. breakfast was delicious. the owners dominique and lenaick were wonderful. they were very knowledgeable about marrakesh, and we enjoyed all their restaurant and activity suggestions. they arranged for a day trip out to ourika valley that was very well enjoyed by all. we inquired about any local shisha bars and instead, the staff gladly set up a hookah right at the hotel for us to enjoy. my boyfriend had to take an early flight back home, and the staff even rose at 3:00am to serve him breakfast! if that's not service, i don't know what is. i highly recommend dar taliwint for those looking for a small, simple but well maintained riad with friendly and knowledgeable hosts. In einem Riad ( historisches Stadthaus mit Innenhof und mindestens einem Brunnen ) erlebten wir ein liebevoll gestaltetes Zimmer und großzügiges Badezimmer in orientalischem Stil mit unglaublich freundlichen und hilfsbereiten Hoteliers die nicht nur für einen Flughafentransfer sorgten, sondern uns mit zahlreichen Tipps und Anregungen versorgten . Jederzeit standen Sie zur Verfügung, wir wurden jeden Tag mit neuen Köstlichkeiten zum Frühstück verwöhnt. Ein wundervolles Hotel für alle die in historischem Flair wie bei Freunden zu Gast sein möchten. emplacement pratique, près du palais de la bahia, parking de la préfecture à proximité, accueil attentionné et remarquable disponibilité du propriétaire des lieux, maison rénovée avec goût et raffinement, propreté irréprochable, petit déjeuner délicieux. une belle adresse calme, au cachet indéniable, d'excellent rapport qualité-prix pour marrakech.